Broccoli Cheese Soup is creamy and savory, made with a seasoned cheddar cheese base and broccoli in ONE POT and ready in under 30 minutes! We love making comforting foods when it’s cold outside, and this week we’re making Ultimate Slow Cooker Pot Roast, Slow Cooker Beef Chili and Ultimate Slow Cooker Beef Stew. Broccoli Cheese Soup is my go-to cheese soup recipe in the winder, made with broccoli, carrots, and celery in a cheddar cheese base. 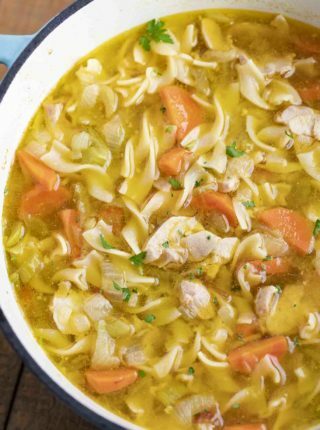 It’s creamy, savory, and really hits the spot on cold winter days. Plus it’s a one-pot dinner, which means less cleanup later! This Broccoli Cheddar Soup is a copycat version of the Panera broccoli cheese soup we can’t get enough of. It’s so simple to make and the whole family loves it. Top with extra cheddar, and sub in heavy cream for even more creaminess in the texture. This is a great recipe to serve with a salad or toasted bread, or as the first course at dinner. HOW DO YOU THICKEN BROCCOLI CHEESE SOUP? 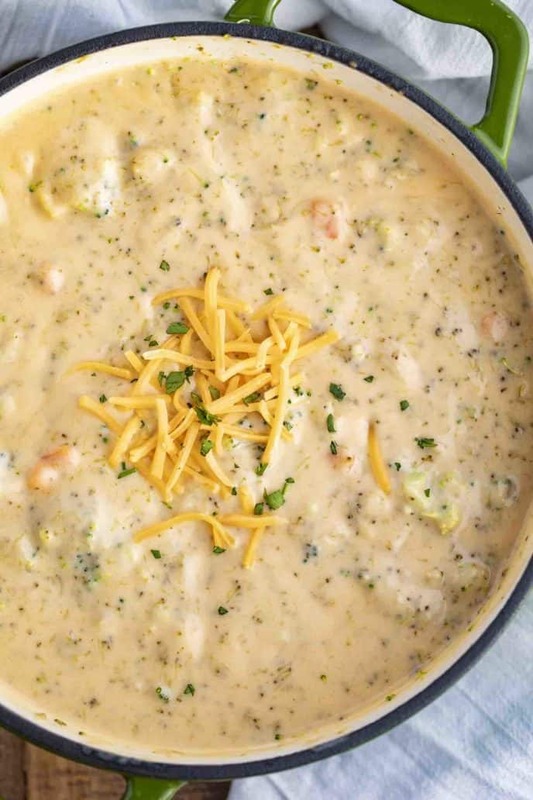 This broccoli cheddar soup starts with a roux of butter and flour oven medium heat that will thicken the rest of the recipe, along with creamy cheese. If your soup doesn’t turn out thick enough, you can mix 3 tablespoons of corn starch with cold chicken broth, then whisk that into the soup. The corn starch will thicken as it heats up. You can also add more cheese to thicken the soup. You can also stir in some cream cheese until fully melted to help thicken the soup texture. WHAT OTHER VEGgies CAN YOU ADD TO BROCCOLI CHEESE SOUP? WHY DID MY BROCCOLI CHEESE SOUP CURDLE? Mixing milk and heat can cause the milk to curdle. You can prevent this by adding the milk slowly, and stirring continuously once it’s in there. 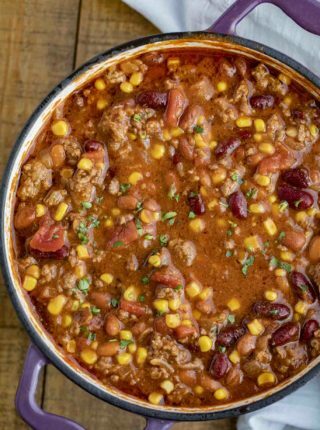 You also want to make sure you add the cheese slowly to avoid it clumping into a grainy texture, and bring the heat down from medium-high to low (to simmer) before adding any dairy. I recommend shredding the cheese yourself, because it will melt better compared to pre-shredded cheese. 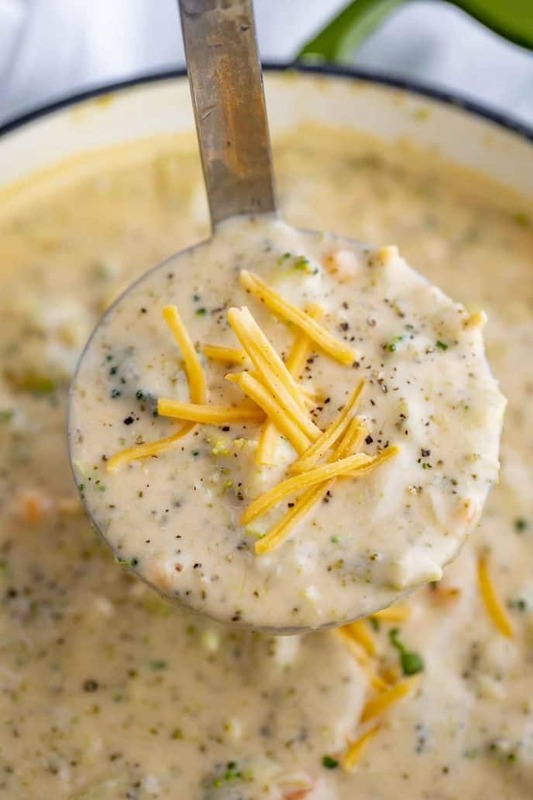 Make broccoli cheddar soup in the slow cooker by whisking together the broth and flour. Add all of the other ingredients (except for cheese and milk) to the slow cooker, then pour broth in, gently stirring together. Cook on high for 4 hours, or on low for 8 hours. About a half hour before the broccoli soup is done, stir in cheese and milk, and finish cooking for the rest of the time. Stir and top with green onions or chives before serving. Use the sauté function and add onions and butter to the pot. Sauté until onions are translucent. Add flour and stir for 1-2 minutes, or until it starts to brown. Slowly add broth and stir. Add all other ingredients (except milk and cheese). Close the pot lid and steam valve. Set on manual for 8 minutes on high. When time is up, let pot release naturally. Stir in milk and cheddar until cheese is melted. HOW LONG WILL BROCCOLI CHEESE SOUP KEEP? Broccoli cheddar soup will last in an airtight container in the refrigerator for 3-4 days. Reheat the soup in a saucepan over medium-low heat for 5 minutes, or until warmed through. 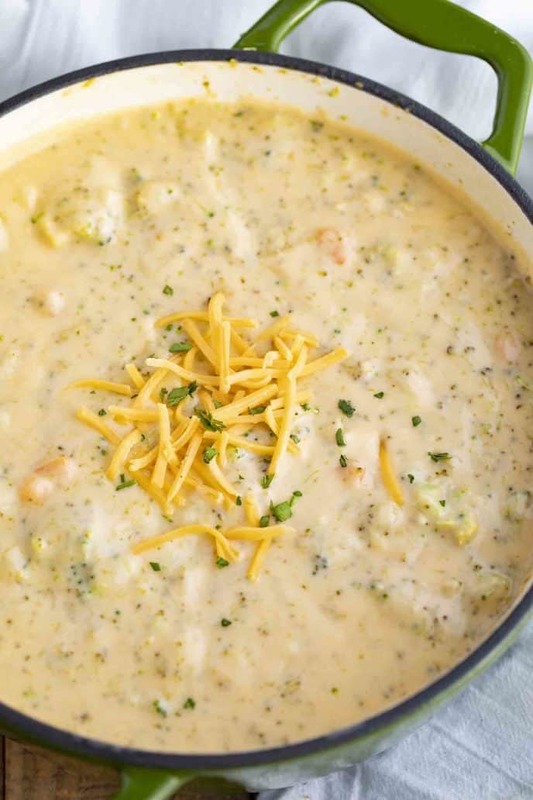 Broccoli cheese soup can be prepped ahead of time and frozen, but I would wait to add the milk and cheddar until you’re reheating the soup, as the dairy won’t freeze well. I also recommend slightly undercooking the broccoli, so when you reheat it, it won’t turn mushy. Serve broccoli soup with cornbread, toasted garlic bread, a baked potato, or with a classic wedge salad. 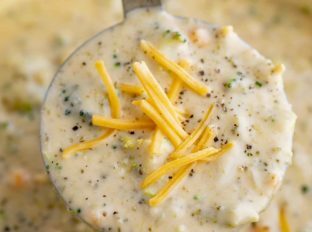 This broccoli cheddar soup recipe calls for whole milk but you can also add heavy cream or half and half. Don’t use low fat or fat free milk because you want the fat that the whole milk or heavy cream add to the dish to get a really creamy texture, just like the Panera version. Puree the broccoli cheddar soup with an immersion blender for less of the bigger pieces of vegetables and a more creamy texture. If you don’t have an immersion blender, try using a potato masher. You can also remove some of the larger pieces of broccoli, puree the soup, then add the broccoli back to give you some large pieces in a creamy texture. You can use fresh broccoli or frozen broccoli for this broccoli cheddar soup recipe. I prefer to use fresh broccoli, because frozen broccoli is already blanched and will cook faster. This broccoli cheddar soup calls for chicken broth but you can sub in vegetable broth if that’s what you have or if you want to make this vegetarian. Use low sodium chicken broth to make this a low sodium broccoli cheddar soup. Hollow out a round loaf of bread, spray with cooking oil and toast in the oven. Then serve this soup in a bread bowl. The smaller you cut up the broccoli, the faster this easy broccoli cheese soup will cook. Top with extra sharp cheddar cheese, chives, or pre-grated parmesan. Or with cooked extra crispy crumbled bacon, or leftover pieces of ham. You can also add a drizzle of olive oil decoratively on top. Make this broccoli cheese soup recipe with shredded chicken or leftover rotisserie for extra protein. Add a dash of nutmeg or garlic for flavor, or cayenne pepper for heat. Add the butter to a large dutch oven on medium heat with the onions and celery and cook for 4-5 minutes until translucent, stirring occasionally then add in the flour whisking well for 1 minute. Add the broth (very slowly) while whisking well until completely smooth then add in the salt and pepper. Add in the broccoli and carrots and cook on low heat for 10 minutes before adding in the milk and cheddar, whisking well and bringing to a low simmer (do not boil). Oh My Gosh !!! So delicious ?I used your recipe for roasting veggies. I had roasted the broccoli and cauliflower the night before then added to this recipe. Amazing !! I also had no chicken broth so substituted with Better Than Bouillon beef flavor. Still Amazing. Thank You for recipe ?? I’m so glad you enjoyed it and took the time to come back and let me know! Thanks for the 5 stars. Made your One Pot Goulash last night. Another Hit !!! Plenty of left overs for dinner tonight !!! Fantastic! So glad you enjoyed it and now you get the night off from cooking! You can find them all easily on the dinnerthendessert facebook page. Simply type in the name of the recipe into the search bar. Enjoy! This soup is delicious! When I started to melt the butter i put in about 3/4 tsp of minced garlic, ( not powder, but the one in a jar). This gave the butter a very nice garlic flavor. I also followed the recipe and used half & half instead of milk. To make it thicker, place half of the soup in a blender and When somewhat smooth, add it back to the soup. It makes a thicker soup and you have a great st tasting and another soup. So glad you enjoyed it, Cindy! This broccoli soup recipe is amazing! A definite keeper. Broccoli and cheese is my all time favorite soup! Making this asap! Followed instructions to the T and came out super fabulous. My picky eaters loved it, it’s even made it to the “LIST” of food they love and I can cook whenever I want to for them. I served it with a grilled ham and mozarella sandwich and was just perfect. Of the recomendations, I would pure the soup with the inmersion blender, just once in a while, to make it a bit different. Thanks for adding something so rich and delicious to our family menu. Love this website. 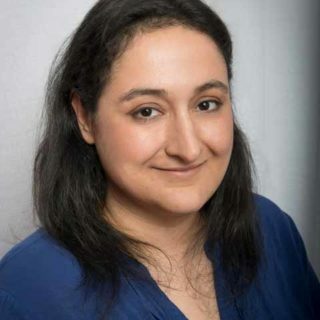 Thanks, Rosina! I really appreciate the 5 star rating. 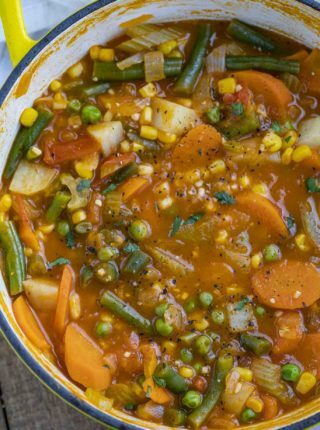 This soup is so much better than the restaurant kind! Perfectly cheesy and creamy! 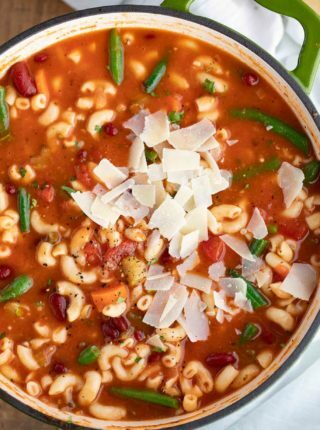 This soup is perfect for this rainy day we are having! Yes, pefect for it! Enjoy! These look so creamy and yummy! Can’t wait to dive into these, so excited to try this! Made this tonight and it is so good. Not quite as thick as Panera’s version but we liked it even better ! Added a little extra chicken broth while cooking vegetables . Thank you for another great recipe, Sabrina ! Thank you so much for coming back to let me know how much you enjoyed it! Is this soup really as good as Panera’s ? Their soup is so thick i didn’t think replication was possible without velveeta (so unhealthy). I’d love to know what you think after trying it! SO GOOD. I’ve never had a broccoli cheese like this before. So much depth, you will NOT be disappointed! I absolutely love this recipe and have made it several times. My husband says it is so much better than Panera’s. My family loves broccoli so I double the recipe and put broccoli in it too!!! I have tried several recipes and this one is without a doubt the best!!!!! I always end up doubling it because they want more. Thank you so much for letting me know, Mahy! So happy to hear that your whole family loves it.